the new crochetme.com and the new freakin awesome book! I got my copy in the mail today, it totally rocks. I want to make almost everything in it. A great read too! Lots of in depth tips and details, great designer profiles, tons of content to spark creativity. And speaking of, if you’re close to Webs, go there today at 2pm for the US launch party for the book! Wish I could be there to support Kim, not that she needs any help, shes a firecracker. print it and make one, post a photo to flickr, show your crochet love. I’m working on the upper right arm. 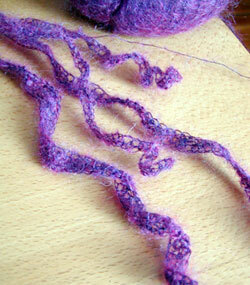 It says to skip the last five stitches in the row (shaping the underarm), which has resulted in a nub on mine. i don’t know what it’s for or if it’s supposed to be there. here is a photo. any ideas? i really appreciate your insight, oh fabulous designer maven!